Lavender is the common name for any of the various plants of the flowering plant genus Lavandula of the mint family (Lamiaceae). In particular, the term commonly is used for the species Lavandula angustifolia (true lavender or common lavender), which is valued for its fragrant flowers and use as a source of essential oil used in perfumery and various medicinal purposes. Generally the flowers are purple, but also may be pink or white. The term lavender is also used to refer to a pale to light purple or violet color. There are about 25-30 species of lavendula. While the flowers of the lavender serve the plant's need of reproduction, they also provide innumerable ecological, commercial, aesthetic, and medicinal values. For bees, the flowers provide a ready source of nectar. For people, lavender flowers provide beauty, are featured in gardens and floral arrangements, and have been used in perfumery for centuries. Lavender also has been used to repel pest insects and as a flavor, and the essential oil has been used as an antiseptic, for aromatherapy, for relaxation, and to treat various medical conditions. Lavandula is native across the Canary Islands, North and East Africa, south Europe, and the Mediterranean, Arabia, and India. Because the cultivated forms are planted in gardens world-wide, they are occasionally found growing wild, as garden escapees, well beyond their natural range. The genus includes herbaceous plants, subshrubs, and small shrubs. The various species of lavendula vary somewhat in appearance and aromatic quality (Longe 2005). L. augustifolia or true lavender is commercially valuable in the perfume industry and is planted in gardens, while L. stoechas, or Spanish or French lavender, is the species probably most used in Roman times as a scenting agent in washing water (Longe 2005) and now used primarily for landscaping. Lavender plants have tiny, tubular, generally mauve-blue blossoms (sometimes white) that grow in whorls of six to ten flowers along square stems that form a terminal spike (Longe 2005). The flowers commonly bloom from June to August and are well liked by bees and serve as a good source of honey (Longe 2005). The evergreen, lanceolate, and opposite leaves are needle-like, downy, and tend to be a light, silver-gray (Longe 2005). There are oil glands in the leaf and blossom, which provide the essential oil for commercial use. The plant contains tannins, couomarins, flavonoids, triterpenoids, and volatile oil as active chemical compounds for medicinal use (Longe 2005). The term lavender comes from the Latin lavare, meaning "to wash," reflecting the uses of the Romans (and ancient Greeks) to use lavender blossoms to scent bath water (Longe 2005). The ancient Greeks called the lavender herb nardus, after the Syrian city of Naarda. It was also commonly called nard. During Roman times, flowers were sold for 100 denarii per pound, which was about the same as a month's wages for a farm laborer, or fifty haircuts from the local barber. commonly used in Roman baths to scent the water, lavender was thought to restore the skin. When the Roman Empire conquered southern Britain, the Romans introduced lavender. 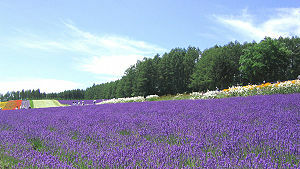 The most common species in cultivation is the true or common lavender Lavandula angustifolia (formerly L. officinalis). A wide range of cultivars can be found. Other commonly grown ornamental species are L. stoechas, L. dentata, and L. multifida. Lavenders are used for their fragrance, ornamentation, repel various pest insects, and for medicinal purposes. Ecologically, they are valued as a source of nectar for plants and to produce honey. Lavenders are grown widely for their beauty and scent. The plant has been grown since ancient times in perfumery, and as an aromatic plant has been said to lift the spirit and chase melancholy (Longe 2005). It has been traditional for women giving birth to clutch sprigs of lavender to bring added courage and strength to the task of childbearing (Longe 2005). Flower spikes are used for dried flower arrangements. The fragrant, pale purple flowers and flower buds are used in potpourris. Because of its fumigant properties, lavender has been hung in homes to repel flies and mosquitoes. Dried and sealed in pouches, they are placed among stored items of clothing to give a fresh fragrance and as a deterrent to moths. Lavender flowers yield abundant nectar, which yields a high quality honey for beekeepers. Lavender monofloral honey is produced primarily in the nations around the Mediterranean, and marketed worldwide as a premium product. Lavender flowers can be candied and are used as cake decoration. Lavender also is used as a herb, either alone or as an ingredient of herbes de Provence. Lavender is used to flavor sugar, the product being called "lavender sugar," and the flowers are sometimes sold in a blend with black tea, as "lavender tea." French chefs in and around Provence, France have been incorporating this herb into their cuisine for many centuries. Lavender lends a floral, slightly sweet and elegant flavor to most dishes. For most cooking applications, it is the dried buds (also referred to as flowers) of lavender that are utilized, though some chefs experiment with the leaves as well. The plant also is grown commercially for extraction of lavender oil from the flowers. This essential oil is used as an antiseptic, for producing perfumes, for aromatherapy, and for medicinal purposes. It is the buds that contain the essential oil of lavender, which is where both the scent and flavor of lavender are best derived. Common lavender (sometimes called English lavender), Lavandula angustifolia, yields a highly effective essential oil with very sweet overtones, and can be used in balms, salves, perfumes, cosmetics, and topical applications. 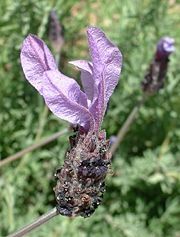 Spanish lavender, Lavandula stoechas, is not used medicinally, but mainly for landscaping purposes. Essential oil of lavender has antiseptic and anti-inflammatory properties. It was used in hospitals during World War II to disinfect floors, walls, and other surfaces. It has been used as a topical disinfectant for wounds; according to some research, in high doses lavender oil can kill many common bacteria, such as typhoid, diptheria, streptococcus, and pneumococcus (Longe 2005). The essential oil is said to have a sedative, antispasmodic, and tranquilizing effect, and has long been used as a headache remedy (Longe 2005). It may be rubbed on the temples, taken in a mild infusion, or sniffed like smelling salts to provide relief from stress-related headaches. 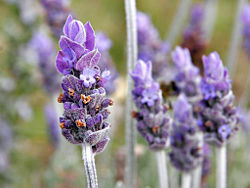 An infusion of lavender is claimed to soothe and heal insect bites. It also has been used as a folk remedy for the bite of some venomous snakes (Longe 2005). Lavender is frequently used as an aid to sleep and relaxation: Seeds and flowers of the plant are added to pillows, and an infusion of three flowerheads added to a cup of boiling water are recommended as a soothing and relaxing bedtime drink. When used in an epsom salt bath in hydrotherapy, it is said that the essential of some lavender species will sooth tired nerves and relieve the pain of neuralgia (Longe 2005). Lavender oil (or extract of Lavender) is claimed to heal acne when used diluted 1:10 with water, rosewater, or witch hazel. It also is also used in the treatment of skin burns and inflammatory conditions. (It is a traditional treatment for these in Iran). There is scientific evidence to support the effectiveness of some of the lavender remedies, especially the anti-inflammatory effects. When taken in moderation the tea, which is mildly sedative, is safe. However, as with other essential oils, high or chronic doses are toxic to the kidney and the liver (Longe 2005). Furthermore, lavender oil can be a powerful allergen. Ingesting lavender should be avoided during pregnancy and breastfeeding (UMMC 2006). Herbs also contain active components that can interact with other herbs, supplements, or medications and trigger side effects (UMMC 2006). A preliminary finding presented at the Endocrine Society's conference in June 2006 had suggested that shampoos, soaps, and body lotions containing lavender and tea tree oils may cause "hormonal imbalances and breast growth in young boys" (Ghassemi 2006). While testing lavender's relaxant effects, a 2002 study found that those subjects who smelled lavender actually did worse on medical tests than those who smelled nothing at all (Longe 2005). Ghassemi, J. G. 2006. Bad shampoo for boys? Washington Post online version, July 4, 2006. Retrieved August 5, 2007. University of Maryland Medical Center (UMMC). 2006. Lavender: Precautions University of Maryland Medical Center. Retrieved January 4, 2008. This page was last modified on 22 June 2018, at 14:33.